The highlight of the year is our Christmas Dinner, which brings together leaders from various backgrounds from across Canada. 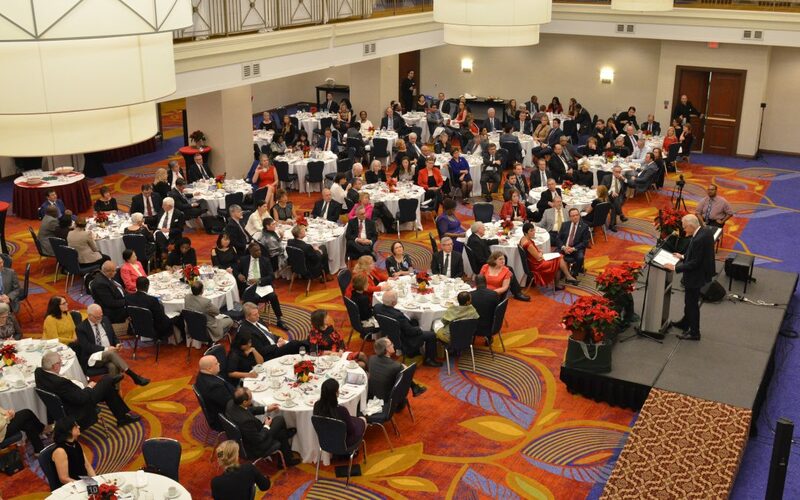 Diplomats, parliamentarians, business leaders and their guests are invited to begin celebrating the Christmas season by enjoying a festive meal, live seasonal music, an inspirational guest speaker, as they connect with one another. Diplomats appreciate what is often a first opportunity to experience Canadian Christmas traditions. It was a wonderful evening. Thank you for having me. I am grateful for your friendship and readiness to help the embassies, Parliament, and businesses establish lines of communication. I think every Ambassador and High Commissioner should connect with the Christian Embassy. Their team will be very helpful to all Ambassadors and High Commissioners for networking because they can introduce you to so many people that can help in your work. The Christmas Dinner was absolutely amazing. Magnificent violin accompaniment, exquisite food, brilliant conversation at the table…. BRAVO for a job well done (the sheer number of guests, and of what caliber! ); I guess one does indeed reap what one sows. Thank you very much for this wonderful evening. We leave with a lot to reflect on. I cannot thank you enough for last evening’s flawless Christmas Dinner Event. It was in every way absolutely outstanding...the amazing piano and flute accompaniment, the cordial ambiance, the enchanting camaraderie, the delicious food, the wonderful company.